Lead the Way Middle School Field Hockey Programs offer consistent training and teaches the fundamental skills of the game in a fun and competitive environment. Through repetition of fundamental skills girls build a strong field hockey foundation preparing them to play at the next level. Practice sessions will include 1v1 skills, passing and receiving and shooting. Each session will include coached scrimmages. Programs are offered to athletes ranging from 5th-8th grade, beginner to advanced players. Participants will be grouped according to their age, playing experience, and current skill level. Beginner to Advanced Goalkeepers are encouraged to register and must provide their own equipment. Requirements: 6th-8th Graders beginner to advanced players welcome. 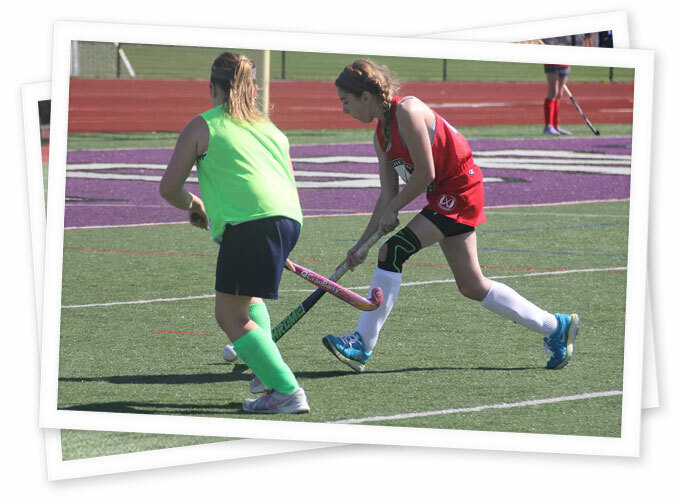 Camps and clinics will teach the basic and technical skills of field hockey, tactical skills that will translate into game play & provide a competitive environment. This camp offers a great way for girls to learn and improve on their basic fundamental skills and learn advanced skills. Daily individual skill development, small-sided game play and a low camper to coach ratio will ensure player development throughout the week. Beginners to Advanced players are encouraged to register and girls will be placed in appropriate skill groups. The goal of the camp is to provide an opportunity to teach field hockey in a fun, competitive and supportive environment, as well as an emphasis on developing leadership skills. In addition girls will also enjoy swimming, kayaking, and team building activities. Our Middle School Clinic is designed for individuals to prepare for their upcoming Fall Season. The clinic is offered to athletes ranging from 5th-8th grade, beginner to advanced players. Participants will be grouped according to their age, playing experience, and current skill level. Included in the clinic will be conditioning drills, individual skills, small game play and team competitions! Emphasis will be on 1v1 skills, passing and receiving and shooting. Beginner to Advanced Goalkeepers are encouraged to register and must provide their own equipment. Check out our FALL LEAGUE Programs page for more info. Fall League registration opens in July.